At Speedy Wiz Transport of the Atlanta area, we believe in supporting local businesses and helping them thrive. We’re excited to take part in a local favorite, the Kennesaw Craft Tour, by giving you the transportation services you need. The beloved restaurants, distilleries, and breweries that are taking part of the Kennesaw Craft Tour have paid for our services to provide a dependable, organized, and free shuttle service for anyone taking part in the Kennesaw Craft Tour. It can be stressful and dangerous not having a reliable and safe ride to your next destination, especially if you have spent the whole evening enjoying yourself at a beer, food, and whiskey tour. At Speedy Wiz, we’re happy to be your designated driver. Enjoy all the features of the Kennesaw Craft Tour by knowing that you’ll have a safe ride to your next destination, whether that destination is a brewery, distillery, or restaurant. The Kennesaw Craft Tour is a beer, whiskey, and food tour, allowing many people to experience the amazing amenities each of the participating small businesses offer. The tour runs the second Saturday of each month, making it a great Kennesaw attraction for many of the local businesses. 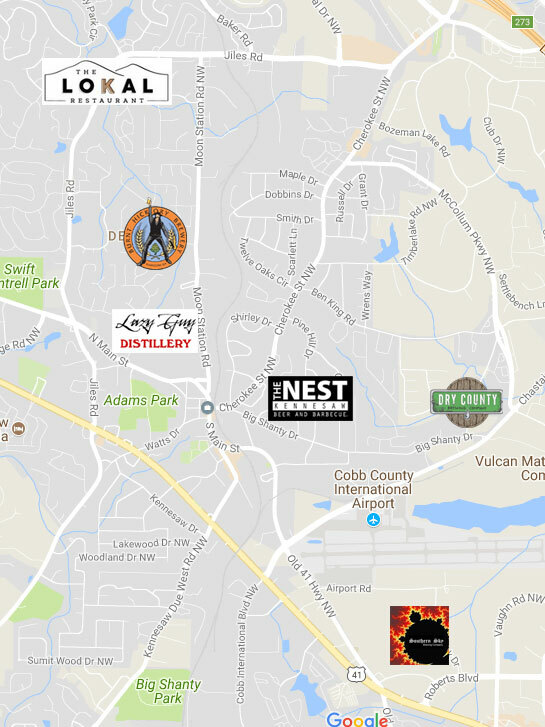 Lazy Guy Distillery: A craft whiskey distillery based out of Kennesaw, GA.
Burnt Hickory Brewery: A microbrewery in Kennesaw, GA. The Nest: A beer and barbeque experience in Kennesaw, GA. The Lokal Restaurant: A restaurant in Kennesaw, GA, offering soups, burgers, and sandwiches. Elevation Chop House: A unique chophouse dining experience in Kennesaw, GA, known for their tableside liquid nitrogen margaritas and martinis. Southern Sky Brewery: A craft beer brewery serving unique brews in Kennesaw, GA.
Dry County Brewing Company: A craft beer brewery in Kennesaw, GA. Need to track your vehicle? Use our handy transport tracker to track the next pickup! Tracking your vehicle is made easy with our app, allowing you to know exactly where to look for the next shuttle pickup. Always being aware of your transportation’s whereabouts makes your experience less about worrying about how you’ll get to your next location and more about focusing on your next delicious drink or meal at the Kennesaw Craft Tour! Check out the route map so that you can know exactly where to be picked up for your next stop on the Kennesaw Craft Tour. Contact us at Speedy Wiz if you want a reliable, professional, and friendly transportation service. We serve the Kennesaw and surrounding areas, making it easy to enjoy your time at the Kennesaw Craft Tour without worrying how you’ll safely get to your next destination. We’re conveniently located in Kennesaw right off Cherokee Street, making us local to the Kennesaw Craft Tour. We’d like to think of it as locals supporting locals!